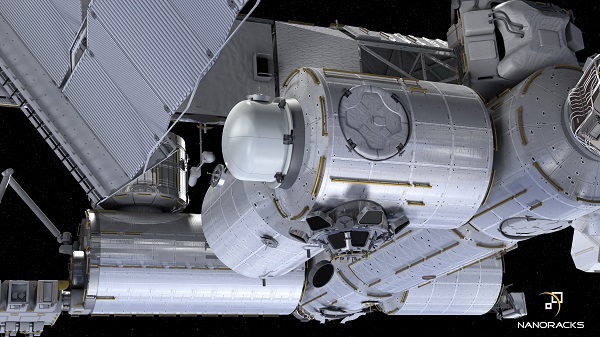 COLORADO SPRINGS, Colo. (NanoRacks PR) – The NanoRacks Space Station Airlock Module “Bishop” met another major milestone with completion of the Critical Design Review (CDR) on March 20 and 21, 2018 in Houston, Texas. This milestone begins the transition from the engineering design phase to the fabrication phase. Detailed design drawings such as those for the critical pressure shell will be signed and released to NanoRacks fabrication partner, Thales Alenia Space, in order for them to continue their fabrication efforts. 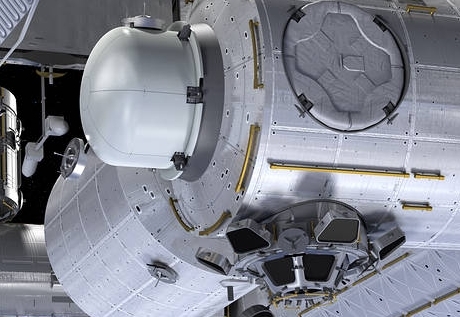 In February 2018, NanoRacks announced that Thales Alenia Space, the joint venture between Thales (67%) and Leonardo (33%), was chosen as the latest partner in its commercial airlock program, joining with a number of key partners, including Boeing. Thales Alenia Space is set to produce and test the critical pressure shell for the NanoRacks Airlock Module and will also manufacture various secondary structures, including the Micrometeoroid Orbital Debris (MMOD) shields with Multi-Layer Isolation (MLI) panels, the power and video grapple fixture support structure and other structural components. Other key features, such as the Passive Common Berthing Mechanism (PCBM), being manufactured by Boeing, require a long lead time and have been in production for over a year now. The PCBM will be delivered to Thales Alenia Space in May 2018 and will then be installed to the pressure shell. The next major milestone is the Phase II Safety Review scheduled for June 2018. The project is still on track to meet the SpaceX CRS-19 launch, targeting fourth quarter 2019. Bishop… like Bishop, Ripley and Newt? Must be small to fit in Dragon’s trunk so it just goes on the Berthing port then? It’s that dome-thing in the picture. It’s actually a clever design. From the looks of it, it’s just a dome that fits to the Common Berthing Mechanism on ISS. Once it’s attached, you just open the hatch on the CBM, fill the thing with nano-satellites, close the hatch, then unbolt it from the CBM and use the SSRMS to position it for satellite release. Is the PCBM really that complex that it takes over a year to build ? I spent a moment trying to figure out how it opened, before reading it’s method of operation. First I thought it was silly, why not just have an outer hatch; but if it opened as I expected, not only do you need to double the area of inevitably leaky sealable/resealable surfaces, you are limited in available directions. By using the robot arm, you can place it on an otherwise useless CBM (radiators are too close for anything larger), but then have access to any direction from the station for either exposure or release.